My Open EOS idea started when I looked carefully inside my newly bought used Canon XT; the mirror is very small and set back. Furthermore, it seems that the lens mounting is artificially held outward by some hollow plastic. I was aware that Argus lenses had been set inside a digital EOS using the body cap as a mounting base, and I wondered if this plastic extender could be removed to help with adapting lenses built to shorter register standards. Since we are mostly using APS-sized sensors at this point the mounting on an EOS can be brought close to the sensor, and the register size can be lower. That would allow adapter manufacturers to accommodate old Canon, Hexanon, and other small register mounts, and possibly old school rangefinder lenses. We could re-start the Soviet camera era! By extending the free software ideas, such as with GNU/Linux, I realized further that a camera could be built to accommodate this body modification in the public domain (or more accurately, the protected public domain of open licensing). The reason I thought of this is that I have had extensive experience with public domain software such as the Linux and L4 operating systems. These systems can be adapted to work inside a Canon in the same way Canon's DryOS works. Prior to DryOS, Canon I believe that used a Unix variant called VxWorks. It so happens that VxWorks is used in common consumer wireless routers, where Linux had been previously used, and often Linux is reinstalled into VxWorks powered routers; so equipping a Canon EOS with Linux should be a snap. Or we could just go with a rangefinder configuration, such as with the Sigma full sensor point and shoot, which is fixed-lens--unfortunately fixed to a maximum aperture opening of f4. And we can even go back to film and manual shutter as well, but with electronic timing. Then moving the concept forward again, we can bring the fully manual shutter release to the digital SLR--all from the same chassis. This is something I have discussed (1 ,2), and debated, extensively. Various mounting adapters would fill the gaps in this scenario. I personally find the EOS "desktop" confusing; but I like Kodak's point and shoot controls on my modest c875. An OpenEOS would allow for any interface to be developed, and it could be developed quickly. I could accommodate any style and allow for fully new concepts; it could even allow for a standard desktop from which you could browse the web, and send email--with wifi of course. I am proposing applying these ideas to the EOS. EOS does not own the mounting interfaces; if they did we would have no M42 adapters. They do own their EOS designs and DryOS. 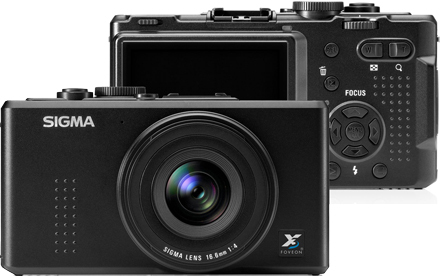 If Sigma's fancy point and shoot had been released with the allowance for Leica or Contax RF mounts, wouldn't you get one? I have read that the Sigma sensor is better with respect to color than the others, though that info may be obsolete. Unfortunately it does not have a 35mm sensor, it is the APS-C size that is 63% of the size of a 35mm negative, as are the most common Canon and Nikon dSLRs. My point is that we can have that, and lots more, by opening the EOS, and as it happens Cosina lens and camera corporation is perfectly positioned to do so. But would they have the inclination and the nerve? Would Canon go for it, could they collaborate? Richard Stallman invented the free software concept as it is used today--usually called "open source" which is actually a misnomer. Stallman will tell you that open source is a diluted version of his model, the GNU public licenses, what I call the protected public domain. His model attempts to force a pure sharing model, where modifications are "re-seeded" back into the field, making them available for other programmers, especially those who created the code concepts. An idea would be to create an original open protocol cameras and lenses, but history has shown that it works best if it "liberates" the proprietary software that is already being used. Stallman "liberated" Unix software to create the top-end of the Linux system; the bottom end, the Linux Kernel was written independently by Linux Torvalds, and merged with the top end, and then joined socially by becoming GNU/Linux. Linux could replace DryOS, but I think L4, the advanced "micro kernel" would be a better platform to develop. To extend the idea of free software to hardware, think of the IBM desktop computer; it was the first open hardware design, and look now, even your laptop is build from the original IBM specifications--it was developed back in early 80s! The desktop is so "compliant" that anyone can see the similarity. Open IS the way to go if you want design efficacy. By keeping the design open, you naturally support "legacy" hardware, that has been the nature of the beast. Right now Linux is actually dumping some VERY old support, but that is being challenged by the free software community. Damn Small Linux, or DSL, is keeping the legacy flames alive. With a true microkernal such as L4, that would not be a problem because of its nearly purely modularized nature. Also, software can be created now that will survive for a century or more, in fact the older software, such as on early IBM mainframes, is better because it was written for less powerful machines. An even better example is the old LISP language that can fit on a legacy floppy. Open development that utilizes a mutual effort, today called e-mutualism is financially very efficient, and would allow participating companies to quickly field offerings. 90% of business expenses fall to purely "parasitic" expenses: rent, parking, payroll taxes, paper clips, lawyer fees, executive bonuses--you get the picture. Health insurance is a big expense also, most governments cover it, but the US. Another and easier way to demonstrate this "parasitic" effect by looking at higher education. The vast majority of college money is spent on things other than professors' salaries and rent for classrooms; the greatest teachers, Plato, Aristotle, the Buddha, Hippocrities all taught under a tree, though not the same tree. It is presently being proved that the old one-room school house gave a far better education than the huge faceless edifices of today's centralized school districts do. Small low-expense operations where "information" is shared, as in the e-mutualist model of the Information Society are the most efficient. The free software e-mutualist movement is even more efficient as an extension of the concept of mutualism, the original framework for human development, and is now accepted as the evolutionary basis for the conceptualization necessary for technological development. To extend this point a little into the business sphere, As it happens, it is small business that recovers broken economies; small business creates all the new jobs; it certainly creates all the new technology--big business just annexes it and makes us pay for it, for the most part. I am not sure what big business does that I need to be thankful for. The 4/3rds camera system that is quickly being adapted for new lenses is a very marginally open system. Most recently introduced is the Micro-4/3rds system that has a very short flange-to-sensor distance. The Micro system is creating a sensation and many adaptors are being made for it already, many more perhaps than EOS because the Micro's mounting flange is much closer to the sensor. Even older 16mm cinematographic may have a new life as Micro 4/3rds lenses. The same problems that EOS adapted manual lenses will exist though; the lenses will have to be focused with the aperture wide open, and then the aperture will have to be closed again to obtain the exposure and take the shot. And there may be focusing problems; the Olympus Micro-4/3 does not have a penta-prism or penta-mirror, it has a digital viewfinder derived from the sensor. It remains to be seen if the digital viewfinder will allow for manual focusing. The 4/3rds protocol is only marginally smaller than the most common dSLR sensor size: the APS-C. The APS-C sensor is 35% greater in size than the 4/3rds sensor. In film photography that would equate to 1/3rd stop, not a significant difference, but perhaps there are other factors in sensor technology that may create exponential differences. The Canon EOS is considered best for low light photography, and 4/3rds not so great, so far. Originally my train of thought for an open EOS was more generalized thinking about an open camera when I stumbled upon a picture of the Fuji Natrua Classica and I started creating a list of criteria for an ideal rangefinder camera, and then recently I modified the criteria to meet the OpenEOS idea. The Natura Classica is a film camera with many digital features looking very much like a digital that had been modified for film--perhaps it was. Sadly it is now discontinued. Criteria for the OpenEOS design are in the bullets below, and would not be limited to digital; the design would be adaptable to film, in fact the design criteria would not be limited to EOS, any mount system would work whose throat would be wide enough to allow the light coming from any lens onto a maximal sized sensor, presumably the 35mm-sized sensor. The EOS flange would be pulled back as close to sensor or film plane as possible, and the adaptor to support, say common EOS lenses, would have enough space to support a number of features that will never be found in either EOS or APS-C arrangements. One of these would be auto-focus for prime, or single focus length (or non-zoom) lenses; the choice of the perfectionist, and the majority of manual focus lenses adapted to dSLR cameras. Zoom lenses with their extra glass, and more complicated optical formulas absorb much of the brightness of the light, and reduce its clarity. This adapter could also allow the lens to tilt, as a Lens Baby attachment does. The ideal camera would fall into two categories: rangefinder-type arrangement, much like a "point-and-shoot," and SLR. In the rangefinder focusing for manual focusing lenses it might have to have spot-center focusing where a central spot in the viewfinder is aimed by the photographer at the subject, a "beeps" tells the photographer when he has focused the lens, and then a button allows the focus to be held: a focus lock. The SLR version might have the same arrangement but the problem facing manual focus lens users remains the same, the aperture has to be stopped down to allow for the proper exposure. The adapter could solve this problem; it could have levers built into to "un-cripple" stop down, or even automatic, metering. DSLR cameras with their in-lens engines, have done away with the aperture closing mechanisms, and the flange adpater could bring them back. The M42 mount with its small pin to stop down the aperture might mechanically be the easiest since the mechanism would have to fit in such a small "collar." Ultimate a hybrid of the rangefinder and SLR designs might work best, that has both a traditional viewfinder and a digital finder. By keeping the design open, components could be created independently to work within the system in different ways. The Contax G1 and G2 are considered to be among the best rangefinders but are like point and shoot cameras with their auto focusing; they use an infrared beam independent of lens for "ranging." Unquestionably I would want a spring loaded mechanically released shutter, which would work well with a CMOS type of sensor. I attribute much of my best photography to the better "timing" allowed my finger by a fully mechanical release, and I have documented and debated the topic widely: here is a link to that writing: Empathy and the Photographer's Finger. The thumb and index finger controls of the Petri Color 35 for aperture and shutter speed. look so cool in a viewfinder like my 24mm Voigtlander. TTL metering integrated with the on-top rangefinder. would control the depth of field (and level of bokeh, of course). collaboration with the L4 OS community. prices according to the public's perception of quality. using them have long been obsolete, if at all. Birger Engineering has an open source EOS mount, if I am not mistaken, for RED cameras.